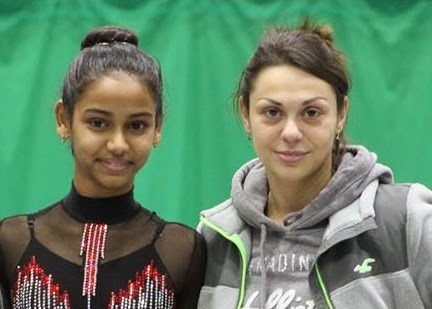 Meghana Reddy Gundlapally - Indian National Team Rhythmic Gymnastics: I am writing this blog to keep you all posted on my journey in Rhythmic Gymnastics. Hope this Blog helps the aspiring Gymnasts in the Country. My First ever National Championship !!! I won the Gold for All-round performance !!!!! This is how my Journey was for winning the first ever All-round Gold in National School Championships. It was 5 am in the morning when my parents, grand parents and myself got up and got ready to leave for the station to join my State team. We were one of the first few to reach the station, once we were there we found the other team players at the platform and joined them. Slowly all the players started coming in so were the coaches. Once every one was present there, the coaches started to call out the names to see if all of them arrived. The train arrived at 7 am and I got in to the train along with the team. A journey of 24 hours began to reach Agra, the city of One of the Seven Wonders of the world "The Taj Mahal" where the competitions were being held. As soon as we reached Agra, me and other rhythmic gymnasts went to the venue - Eklavya Stadium and started our practice. We continued our practice for about 3 hours and went directly for Lunch. We came back at 4 pm for practice again this time for 2 hours. Today was the competition for the under 14 age group. Since there was nobody to help the younger kids with their routines, I started helping them for the day. Today was the day that I had been preparing for the past three years.AP State that I represented was the 11th in serial number to perform in the sequence. My competition at around 1 pm started with the apparatus Hoop. Hoop : I did basic warm-up for Hoop and started practising for my risks and mastery. Then went on to practise my difficulties individually. I practised my whole routine like 5 times. Then I got ready to go onto the floor. There were 48 players from 12 States and I was the last player to approach the floor from my state. 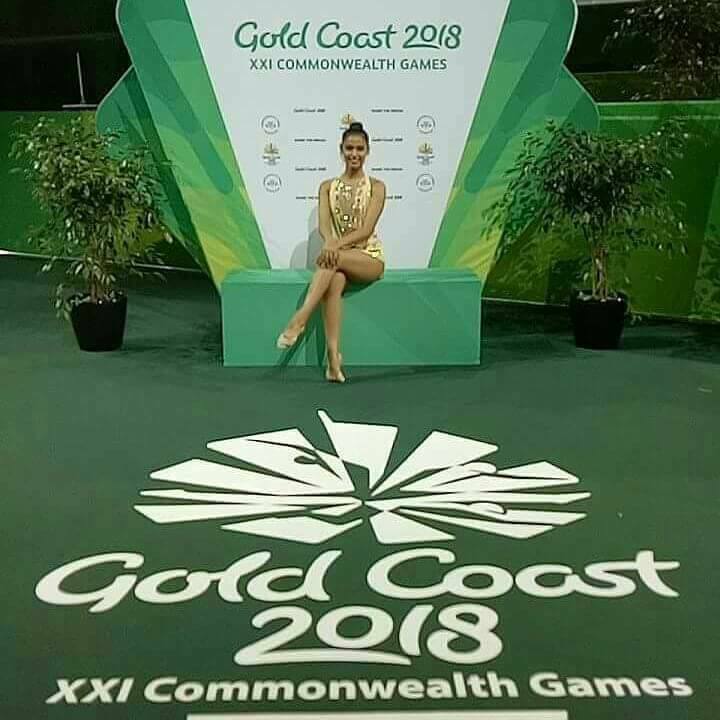 While I was waiting for my team mates to finish their performance, I was kind of little nervous but then I made up my mind that this was the moment i had been preparing for and this was my chance to show everyone my capability. As I approached the floor I felt more confident. I gave my performance with 100% effort and was really happy with the finishing. When they announced my score as 12.81 I was thrilled. The over all Result : GOLD. Ball : I took a little break to have something to munch and started practising for my BALL again. My performance for ball had not gone as I had hoped. There were two faults in my routine because of which I slipped to 4th position. I was really upset as i might have felt over confident after my success in Hoop routine. For my next performance i decided to concentrate well. Clubs: This was one of my favourite apparatus. I decided I had to perform the best amongst my competitors. There weren't any mistakes in this routine. I was quite happy with this performance. I stood in the top position among the competitors. The overall Result : GOLD. Ribbon : This is my favourite apparatus since the music represents the cheerfulness. When I was entering the floor I thought this was the final apparatus and I should give my best performance. This routine turnout to be one of my best since I enjoyed performing my routine to the music. The moment I finished the last routine I felt really relieved and happy. The final result of this apparatus was SILVER. By the time the competition got over, it was 9 PM. We went back and fell asleep. There were no competitions on this day. We decided little site seeing, just before we started I got really sick because of which we had to cancel our trip. For rest of the day all I did was take rest. Today I was feeling much better. I came to see the performance of under 19 competitions. The only medal that my state got in this competition was a bronze in Ball. After the under 19 competition was over, they organised a small demo in which i performed. We were given the medals on this day. 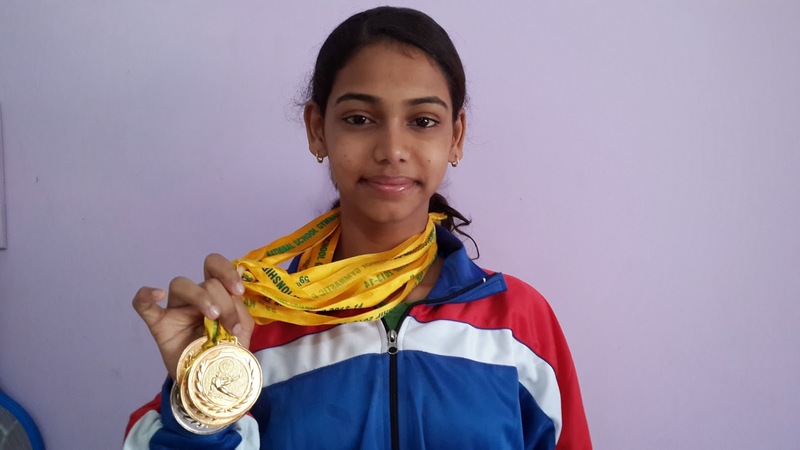 I felt really proud to bring laurels to Andhra Pradesh State, while taking the medals. 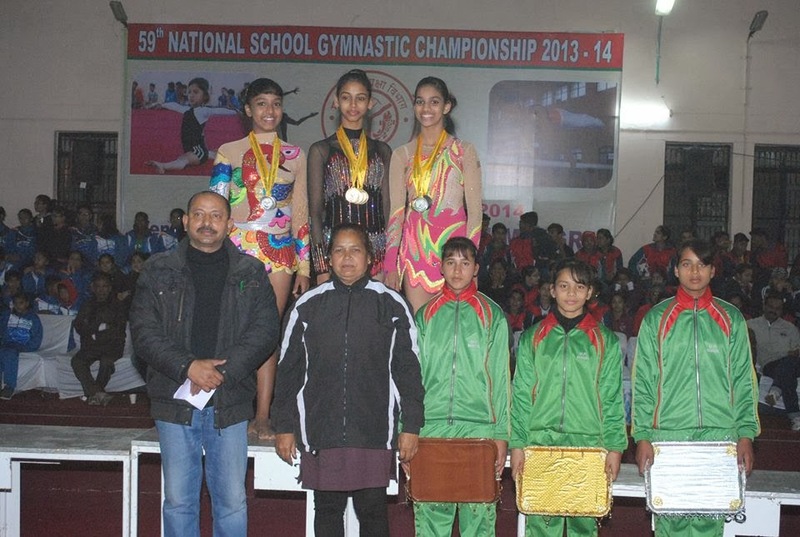 This was the first time ever our State got Medals in Rhythmic Gymnastics. My overall score was the highest in the entire tournament. I was also adjudged as the Best Player in my category and received the overall GOLD. The next day on 1st February,2014, we had the closing ceremony where AP State received the team Bronze in under 17 category. After the closing ceremony,we went to see The Taj Mahal. 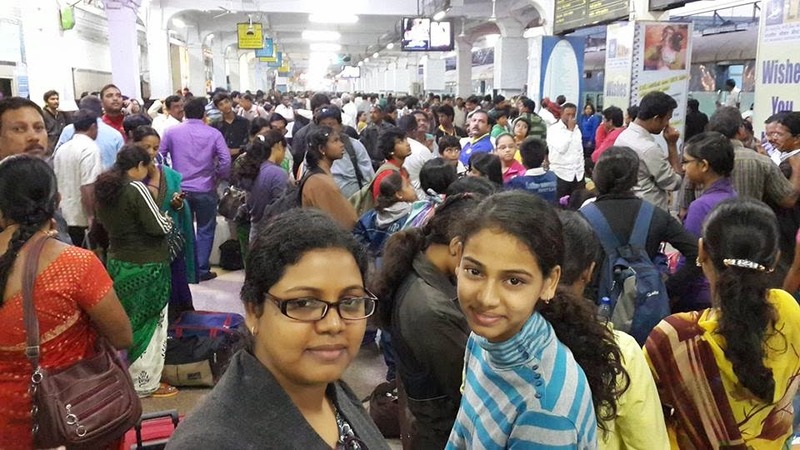 From there we went to our rooms to collect our luggage and move to catch our Train back to Hyderabad. In all this trip it has been really amazing and everyone was happy to hear that I received three Gold Medals in my first ever Nationals. 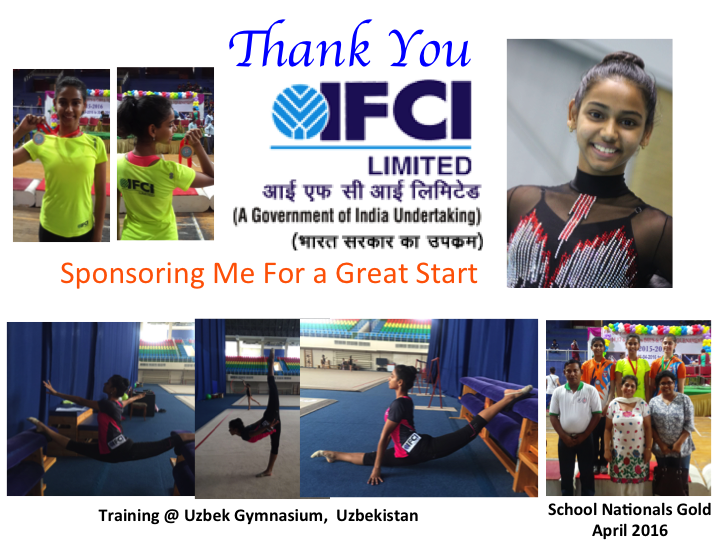 I was really glad that my training has helped me to claim three Gold,one Silver and one Bronze medals in my first National level performance. This is just the beginning of my career where I would be striving hard for winning even more medals in future for my state and to my country. My learning : Never to get over confident, but to enjoy what you are doing.